This is a simply designed acrylic shelf that can be attached to either slatwall or gridwall panels. This shelf is constructed of clear acrylic. This clear design makes it perfect for any retail environment due to its ability to seamlessly blend in with your current design aesthetic. The front lip keeps your products held securely in place. 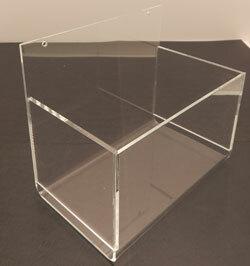 The acrylic used in the construction of our shelves is of the highest quality to ensure durability. A slanted acrylic shelf w/lip. Ideal for displaying books, shoes and other packaged merchandise. Lipped edge prevents products from slipping. Available in 3 sizes.